The S-B: A GOLDFINCH YEAR? I confess I was nervous about reading Donna Tartt's third novel, The Goldfinch. So nervous, in fact, that I put it off as long as possible. It wasn't the length (780+ pages) or that I didn't want to read it. I did. It was just that, like many others, I'd loved The Secret History with a passion, reading it, head down, walking along the street, missing tube stops, ignoring colleagues' greetings, quite literally narrowly avoiding an altercation with a lamp-post. Again, like many others, I waited ten years for a follow up. When Little Friend arrived, I devoured it. Or tried to. Some scenes still stick in my mind, images conjured as vividly as if from my own life, but, in the main, I struggled, crawling towards what passed for the climax. And so, ten years further on, I hedged around The Goldfinch for weeks. Terrified it would be more Little Friend than Secret History. Skirting it, engaging in a complicated dance, putting it down, picking it up, lured eventually by the thriller-like prologue, set in Amsterdam some fourteen years after the death of Theodore Decker's mother. Tartt has never flinched from seemingly giving the plot away on the first page - she did so in The Secret History, and she does so here. From Amsterdam, where Theo (somehow he is not and never will be Decker, or even Theodore), Tartt plunges us back to the day Theo's art-loving mother died (in a terrorist explosion at the Metropolitan Museum of art). It is not so much this bomb that alters the course of Theo's life, but its immediate aftermath. Coming to in the wreckage, he comforts a dying man who exhorts him to save the valuable work of art his mother was showing him minutes before the explosion, The Goldfinch (a real painting by Fabritius, a student of Rembrandt who also died in an explosion in 1654). This act and Welty, the dying man who prompted it, set Theo on a trajectory from the privileged apartments of the upper east side to Las Vegas, and the barren deserts that surround it, with his gambler father. There he meets Boris - a wonderful character but the kind of best friend his mother would have crossed a continent to avoid - before a memorable greyhound ride back to Greenwich village and eventually on to Europe. His mother's ghost, his growing addiction and his obsession with the stolen painting haunting his every step. There is much more to say, more wonderful vivid characters to celebrate - frail redhead Pippa, antique-restoring father figure Hobie, Theo's ill-fated childhood friend Andy Barbour - but I will leave you to encounter them for yourself as all good storytellers should. For this is what Tartt is, first and foremost, a storyteller. Comparisons with Dickens started with Stephen King's review in the New York Times and they have gathered pace since. Oliver Twist, David Copperfield and Great Expectations chief amongst them. And they are not overblown. In spring this year, a furore broke out over wikipedia's definition of Great American Novelists - it was, of course, a list of Great American male novelists. No Harper Lee, no Flannery O'Connor, no Mary McCarthy... no Donna Tartt. With this, her third work, clearly a labour of love, Tartt has surely secured her place on any subsequent list. The Goldfinch is truly a great novel. That it is American is almost beside the point. 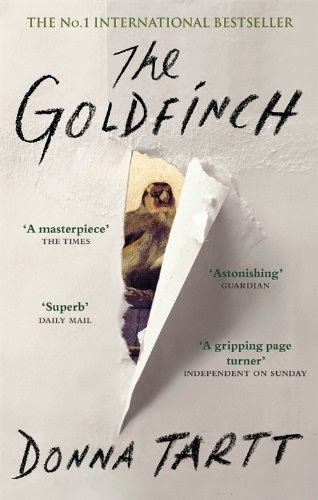 The Goldfinch by Donna Tartt is 2-1 favourite to win the Baileys Women's Prize for Fiction on wednesday. It is out in paperback on thursday.